Though Sean Manning scoffs with no small measure of discomfort when people use the word “visionary” to describe him, there’s no denying the vision it took to bring Freedom Run Winery to life – but there’s also no denying it was anything but a singular effort. Three years ago, Sean stood with brothers Larry and Chip at the edge of the 90-acre property on the bench of the Niagara Escarpment where the vineyard now stands, looking out over the 1000-tree apple orchard and gently sloping wheat field that was there when he took ownership. The trio was tossing around ideas on what to do with the land, which sits just a few minutes from where three generations of Mannings settled and raised their families in Cambria, New York. It was Larry – now Freedom Run’s chief operating officer – who suggested they open a winery. The rest, as they say, is history. Today, Freedom Run – the name of which pays homage to the route slaves took along the escarpment to get to the narrowest part of the Niagara River, where they swam to their freedom in Canada – is a true family enterprise. Along with Larry, who oversees Freedom Run’s day-to-day operations, Chip, co-owner and agricultural manager, tends to its 15 acres of grapes and the apple trees that still stand on-site. And most of the extended Manning family – from mother Maureen on down to Sean’s 13 nieces and nephews – is also actively involved. Sean, of course, wouldn’t have it any other way. A retired electronics industry executive, the 45-year-old Sean isn’t done putting his stamp on Freedom Run by a long shot. 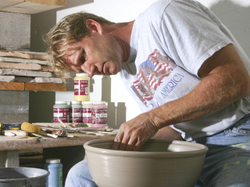 These days, Sean, who divides his time between Cambria and St. Petersburg, Florida, spends a good portion of his free time at the potter’s wheel in his on-site artist’s studio, shaping clay into pieces that adorn the winery’s exceptional tasting room. Among others, there are plans to restore a circa-1826 stone house on the property to its original beauty and turn it into a champagne house. But at the end of the day, being able to work shoulder to shoulder with his brothers and other family members is what propels Sean forward – and is square at the heart of what Freedom Run is all about. For Sean, it’s also very much about recognizing and honoring his roots – while at the same time laying the foundation for the future.